We focus on what is largely required in cutting copper and stainless steel tubes at the product design stage. Most importantly the cutting wheel must rotate straight to complete cutting. The cutter must also rotate around the pipe smoothly. For this reason, MCC installed 6 (six) individually sealed stainless steel ball bearings on the frame and 1 (one) needle bearing in the cutting wheel. 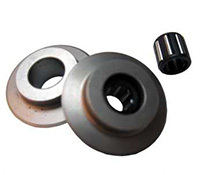 This sounds like an unusual application of ball bearings; however once you take a look at the wheels of some of your carts in the warehouse, you will discover bearings on slower revolving parts such the casters where the wheels are attached. Under a high amount of weight and pressure, ball bearings are of great assistance. Tubing Cutters work in the same way. 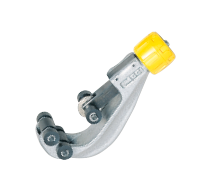 When your tubing cutters are new, you might hardly notice the difference between MCC tubing cutters and an ordinary pair of cutters that do not have a bearing installed. However, after one month of use, you will clearly notice the difference between the two cutters. 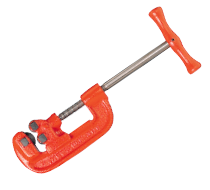 MCC Tubing Cutters are designed specifically to make clean rotational cuts; weather you are cutting Copper Tubing or Stainless Steel Tubing. Well-designed components provide longer lasting sustainability making the cutter highly economical. Compact & lightweight design increases your productivity. 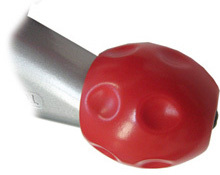 Ergonomically designed knob reduces stress on your hands. The heavy-duty cutting wheel with a bearing inside maximizes the durability of the cutting wheel when cutting stainless steel tubing. 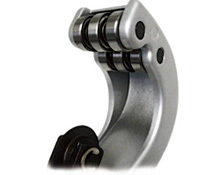 Compared to many ordinary cutters on the market that have plastic or steel rollers on its frame, MCC's Tubing Cutters have six individual stainless steel ball bearings installed. These bearings substantially improve not only the smoothness of your cuts, but also the straightness of your cuts. It will always provide you an accurate and effortless cut. Tubing Cutters rotate around the pipe while operating. The bigger the cutters are, the more motion that is required for its operation, which ends up creating substantial amounts of stress on your hands. 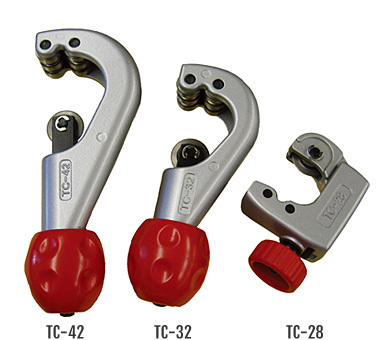 MCC Tubing Cutters have one of the most compact designs in the market today; particularly MCC's Model No. TC-42. Taking a quick telescopic action feature from the cutters and focusing it on the simple components for the compact design is what MCC has done for these cutters to provide the best quality in today's market. The knob is the part that you will apply your motion. It is the part you touch and operate. 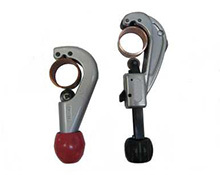 To make you feel comfortable in operating MCC's Tubing Cutters for extended periods of time, we have specially designed an ergonomic knob, which will comfortably fit in the palm of your hands and let you grip firmly. The cutting wheel is designed to cut not only copper tubing, but also stainless steel tubing. The heavy-duty cutting wheel is conveniently designed and does not require you to change out the cutting wheel or cutters if you are working with different types of tubing. The cutting edge is uniquely designed and made of Japanese special high carbon alloy steel that has gone through a careful heat treatment to keep its sharpness and durability. It will last longer than any of the other brands on the market today.